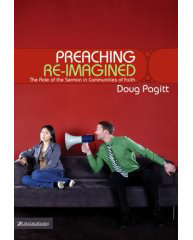 Pagitt wants to reconceive the purpose of the church and the way it accomplishes spiritual formation as a fundamental reorientation that moves people from being passive listeners to active learners. In Preaching Re-Imagined he extends this concern to what he sees as the last "unfunded mandate" of the Reformation—the final implementation of the priesthood of all believers as it affects preaching. I sure wish I could attend a church where this was the goal! You can read my review of the book here. Um, Bill, your link to the review seems to lead right back to this current article. I meant your review of the book.